LEXINGTON, Ky. (November 6, 2018) – Chuck Grubbs of Georgetown, Kentucky, cashed more than $87,000 in winning wagers on the Breeders’ Cup Classic, jumping from 31st place to the top of the leaderboard to win the 2018 Breeders’ Cup Betting Challenge (BCBC) at last weekend’s Breeders’ Cup World Championships. Grubbs finished with a total score of 94,020 and with a first place prize of $300,000, had total winnings of $394,020, besting second-place finisher Ed Abel of West Des Moines, Iowa, who had 86,330 points and combined with his second-place prize of $200,000 had total winnings of 286,330. The 10th Breeders’ Cup Betting Challenge, Thoroughbred racing’s biggest live money tournament, was held November 2-3 at Churchill Downs and from official satellite locations at Gulfstream Park in Hallandale Beach, Florida, Monmouth Park in Oceanport, New Jersey and Santa Anita Park in Arcadia, California, and online at participating ADW sites. In the BCBC each player was required to fund a $2,500 buy-in and a $7,500 betting bankroll ($10,000 total). All buy-in monies were applied to the prize pool, making the total prize pool $977,500. Players made real wagers (Win, Place, Show, Exacta, Trifecta and Daily Double) with their $7,500 bankroll on 21 races over the two days and kept all monies earned from their wagering. Top prizes were $300,000 for first, $200,000 for second and $100,000 for third. Complete tournament results are available at http://www.breederscup.com/bcbc/leaderboard. Accelerate paid $7.40 to win. Grubbs also made two $40 Trifecta wagers using Accelerate and Gunnevera and Accelerate and Mind Your Biscuits in the first two positions. “Gunnevera was very consistent, not in winning, but he was always in the money,” said Grubbs. “I thought he would make a strong run in the stretch and he did.” Gunnevera finished one length behind Accelerate for second. Thunder Snow completed the trifecta, and Grubbs earned $64,000. Combined with win bet on Accelerate, he pushed his bankroll to $94,020 and the BCBC title. · Averaging wagering for each BCBC player in 2018 was $12,512 compared to $12,161 in 2017. · The Breeders’ Cup Betting Challenge on track handle at Churchill Downs was $2,487,670 or 12.52% of on track handle during Breeders’ Cup weekend. This year’s BCBC awarded 15 automatic berths into the 2019 National Horseplayers Championship, February 8-10, in Las Vegas. The Breeders’ Cup administers the Breeders’ Cup World Championships, Thoroughbred racing’s year-end Championships. 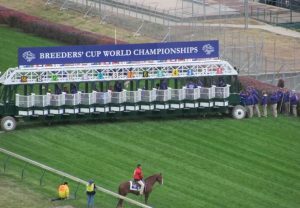 The Breeders’ Cup also administers the Breeders’ Cup Challenge qualifying series, which provides automatic starting positions into the Championships races. The 2018 Breeders’ Cup World Championships, consisting of 14 races (13 Grade 1 events) with purses and awards totaling more than $30 million, was held on November 2-3 at Churchill Downs in Louisville, Ky. Breeders’ Cup press releases appear on the Breeders’ Cup website, www.breederscup.com. You can also follow the Breeders’ Cup on social media platforms Facebook, Twitter, Instagram and YouTube. Neck of the Moon (Belmont Park – 10/24/15 – Race #11 -#2 – 1 1/16 on the turf) – rider Irad Ortiz at the controls for Chad Brown, and this mare broke outward when the gates sprang open and he was forced to take up his mount just a bit. Once she got moving all was looking well and shifted out four wide and settled down for the stretch run. – She was motoring late for the red-hot connections, and give this race a pass as she compromised quite bit from post #9 in a full field, and this leaves little to no room for any added pressure. – She’ll circle the field next out, and be on the lookout for this runner from the Chad Brown barn. Temper Mint Patty (Belmont Park – 10/24/15 – Race 10- #5 – 1 1/16 on the dirt) – Jockey Luis Saez had the call for Todd Pletcher, and was forced to go four wide around the turn, and had to go out even farther to find her best stride. Once she had her mind on business, she leveled out nicely and made a solid move to be second. – I think with a little kinder trip she’ll give them fits down the lane. Merry’s Honor (Parx -(10/20/15 – Race #4 – #5 – 5f on the turf) – Joshua Navarro had the mount, and was begging out for running room down the lane. When you are sprinting a quick distance it only takes a momentary check along the rail or running up on heels to keep you out of the winner’s circle. – He was held up under stout restraint and once he had a path it was a quick turn of foot and a dirty nose short of getting the job done. – Look for this runner next up as he had handfuls of runner down the stretch. Hunter O’Riley (Keeneland – 10/21/15 – Race #4 – #3 – 1 1/8 on the turf) – The hot hand of Corey Lanerie had the call for Joe Sharp, and this runner did everything but win. He started rolling like a down bound train and shifted out for clear sailing. He was bested by Dissident who exited the (G-3) Pilgrim and came back into the maiden ranks. The winner ran against three runners who you’ll see this weekend, and to only lose by a nose gives us no excuse, but a great deal of hope when you see him at Churchill Downs. Cold Dish (Keeneland -10/21/15 – Race #6 – #1 – 1 1/16 on the dirt) – This filly had the services of Calvin Borel, and with his new agent of Larry Melancon aboard. I am looking forward to seeing “Calvin Bo-Rail” bring this gal right back at CD. He broke from the 1 post and shifted into the three path for a better run. He had the lead for a brief second or two at (8-1), and was beaten in a tough photo by a nose. – Look for a return to the Twin Spires where Calvin has done very well in past meets. Vanity Feature (Keeneland – 10/22/15 – Race #5 – #4 – 7f on the dirt) – Marcelino Pedroza had the call for the red-hot Tom Drury barn winning (31%). – He broke a bit slow, and was tussled around leaving the gate. Once he regained composure he took over the lead and looked like a winner nearing the 1/4 pole. He was eventually wore down under the salty fractions of 110.1. – Team Drury is one to keep your eye on and you can bet dollars to donuts he’ll have all the screws tightened down for the Turfway Park meet. Bullard’s Alley (Keeneland- 10/21/15 – Race #7 – #9 – 1 3/16 on the turf) – This 35-1 shot was handled by Marcelino Pedroza and gave his backers something to root for down the lane. His trainer Tim Glyshaw was happy with the run, but actually thought he could win despite being dismissed by the public. – He swung out wide to make his rally and bumped and bothered his foes a few times. He’ll be a handful down the long stretch at Churchill Downs. 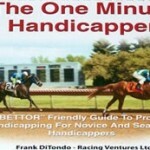 PDF worksheets of The One Minute Handicapper were offered for the first time on the Breeders’ Cup weekend, and there were several nice winners pinpointed on the big day, Saturday, November 3. Santa Anita race 2) Winner GABRIEL CHARLES was one of four horses with 7 or more X+K Angles as identified by the program. The 20-1 Morning line horse scored easily, paying $11.80 to win. Santa Anita race 6) Winner TAPIZAR was tied for the most X+K Angles with 9. He had the following angles: Back Class, Favorable Jockey/Change, Favorable Jockey/Trainer combo, short Layoff, Preferred Track, Favorable Trainer stats, Troubled Trip last race, Wet to dry track today, and finally Favorable Workouts. He paid a tremendous $32.60 to win, and keyed a $245.60 over Rail Trip, who was also tied with 9 total angles! Santa Anita race 7) Winner MIZDIRECTION was tied with Camp Victory for the most X+K Angles with 8. The 20-1 morning line horse scored to the tune of $15.80! Santa Anita race 8: Bomber runner-up HE’S HAD ENOUGH was one of the few horses on the entire card that had the powerful OMH angle of PMF – Moving from a poor post position to a more favorable post for today’s race. He lost by a short head to the favorite after a very unlucky trip. Santa Anita race 12) Winner FORT LARNED was tied with To Honor And Serve for the most X+K Angles with 9. Mucho Macho Man completed the $125.40 exacta in a thrilling edition of the Breeders’ Cup Classic. Learn how to handicap more efficiently and apply important modern and traditional handicapping angles with the help of The One Minute Handicapper software. 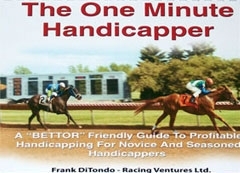 The software is based on the comprehensive handicapping guide written by Frank DiTondo. Off the Charts Trip Notes (July 24, 2012) spotlights horses throughout the country who encountered some type of significant or meaningful trouble in their most recent start or just gave an extremely impressive performance. Please note that horses spotlighted in Off the Charts Trip Notes are never an automatic bet back, but rather runners to give a serious look at given the trips and the trouble spotted by our expert handicappers at AGameofSkill.com. Horses below listed in track name order. Race 3 on opening day featured notable troubled trips for three runners, each of whom are discussed below. NONSENSE (Race 3 at DMR, July 18, claimer, 1 1/16 poly). This live longshot stumbled very badly at the start despite my favorite announcer calling a “good start for all.” Bided his time in last after the awful start before making a strong move into the far turn. Went extremely wide at the top of the stretch, losing all chance again, but was not beaten far in the end. Sneaky great performance for horse that loves the all weather. CELESTIC NIGHT (Race 3 at DMR, July 18, claimer, 1 1/16 poly). One of the betting favorites, his troubled trip was highlighted on TVG so not likely to get a price on this guy next time. Leparoux took the inside route and that didn’t work as he blocked at the 1/8th pole and then was steadied between horses just as he was ready to make a big run. With a clean path he could have won. FIRE BREAK (Race 3 at DMR, July 18, claimer, 1 1/16 poly). This was the other finisher out of race 3 who could have fared much better with an improved trip. Simply put, this guy was wide pretty much every step of the way, beginning with going 5 wide on the first turn. He gave up several lengths to some of the other rivals in here yet still managed to finish a solid third, beaten only 3 1/2 lengths at the wire. YANKEE REBEL (Race 2 at DMR, July 19, mdcl 80, 5f poly). This first time starter for trainer Bob Hess was visually impressive as he powered home late and won with no urging from jockey Garrett Gomez. This guy should be able to handle a step up in class. 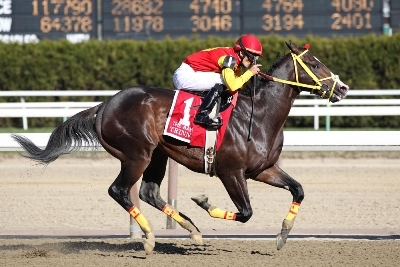 SHE SPIRIT DI SU (Ire) (Race 3 at DMR, July 19, turf). Second choice in the wagering, she waited briefly at the top of the lane when the jock then decided to go the inside route. Jock very briefly looked to alter course at the 1/8th pole but then again ducked to the inside and she finished very strongly up the rail and inside of horses, which is difficult to do. Narrowly missed on the wire. MISSDEALORNODEAL (Race 6 DMR, July 19th, polytrack, 5 ½ furlongs) Heavy favorite in field of nine. Stumbled severely at start with her nose touching the ground and instantly falling 9-10 lengths from early leaders. The mare showed great courage and determination going very wide and passing others to earn a close third. No doubt she was the best horse in the field. MAGIC SCHOOL (Race 7 at DMR, July 19). Talamo mount trailed in a swiftly run 5-horse field. Proceeded to make a winning run into the far turn but was then blocked behind a trio of runners at the top of the stretch. Was steadied at the 1/8th pole and, while this was happening, the runner tried to savage (bite) the horse to his outside. Cleaner trip would have put this one much closer at the wire. ACAFFELLA (Race 7 at DMR, July 22, claimer $40k, 1 1/16 miles). This closer was making a huge late run down the middle of track and was very unlucky to get squeezed between horses nearing the 1/16th pole. The race was won by the classy Jaycito, but this 4yo son of Mr. Greeley would have given him a run to the wire. Loves the synthetic tracks. SALTO (Ire) (Race 1 at SAR, July 20, 1m inner turf). This guy suffered a very unlucky trip in this two turn route affair. He was buried down inside for most of the running, blocked at the top of the lane and blocked again midway down the stretch as he was making a strong late run. Certainly deserves another chance as he lost whatever chance he had on this day under Javier Castellano who is normally one of the best turf riders on the grounds. MR. C’S LEGACY (Race 4 at TDN, mdspwt, 6f dirt). This first time starter showed very good early speed and pressured the legitimate 1-5 favorite, a shipper from Keeneland, throughout the entire race before giving way in the final 1/8th of a mile. Easily held 2nd in a strong performance. Doesn’t has the best way of going (action) but that shouldn’t stop him from breaking his maiden in the near future. PASSIONISTA and AMERICANA RAISA (Race 2, July 22 at WO, polytrack, 6 furlongs) A pair of 2 year old fillies bet 6th and 7th in a field of 7, respectively. Both fillies ran between others down the backstretch. American Raisa was the first of the two to check in tight quarters and back out of contention just short of the 5/8 pole. Passionista, who appeared sharp with the addition of blinkers, checked sharply just before the turn. Both dropped way back and lost all hopes of securing a paycheck. They are eligible to improve in a big way in their next starts. Off the Charts Trip Notes (July 18, 2012) spotlights horses throughout the country who encountered some type of significant or meaningful trouble in their most recent start or just gave an extremely impressive performance. Please note that horses spotlighted in Off the Charts Trip Notes are never an automatic bet back, but rather runners to give a serious look at given the trips and the trouble spotted by our expert handicappers at AGameofSkill.com. Horses below listed in track name order. CAPE CODE CAROL (Race 5 at BEL, July 15, s-mdspwt, 6f turf). This James Ryerson runner absolutely flew home in the final 1/8th, just running out of real estate to nap the place spot. Gave a similar performance the last time Junior Alvarado was aboard, two starts back. Daughter of Rockport Harbor would likely relish 8 furlongs on the grass. TIZ A MINSTER (Race 2 at BHP, July 15, 5f mdcl). First time starter trailed the field early, double digit lengths behind the eventual gate to wire, winning favorite. Jockey waited briefly on the far turn to see where a loose horse was going, then at the top of the stretch, he asked and this horse responded with a tremendous late run. Was flying at the finished and narrowly missed 2nd, blowing past that rival at the wire. Solid barn has been cold and continues their unlucky ways. BUST OUT (Race 7, July 12, CBY, 6 furlongs, dirt). Fourth choice in field of 10. Filly stumbled badly at start with her nose close to touching the racing surface. Was not urged at all on backstretch and was last 10 lengths behind at the quarter pole. Picked it up and passed horses in stretch while racing inside and outside. BEARS GEM (Race 2 at WO, July 15, mdspwt, 6.5 furlongs). This filly went extremely wide on the turn for home under Emma Jane Wilson but still continued on well in the lane to get up for third. May very well need a rider switch as Wilson has been aboard for all three career starts. ALPHANUMERIC (Race 7 at WO, July 15, mdcl, 1 1/16). This was only this colt’s third start on the all-weather as he has spent most of his winless career on the grass. This was probably his best race yet as he made a furious run at the top of the stretch only to be blocked at a critical late stage, costing him valuable momentum. Ended up a very close fourth behind a trio of horses noses apart at the wire. CALGARY CAT (Race 8, July 14, WO, two year olds, 6 furlongs main). Favorite in field of 7. Awkward start and shortly thereafter squeezed hard on both sides, taken up sharply and left far behind. The unraced favorite was a debut runner in stakes competition and showed class by making a good comeback. Should have finished dead last after the start and running wide throughout the turn but showed plenty of class to gain fifth not that far from the winner. Off the Charts Trip Notes (June 27, 2012) spotlights horses throughout the country who encountered some type of significant or meaningful trouble in their most recent start or just gave an extremely impressive performance. Please note that horses spotlighted in Off the Charts Trip Notes are never an automatic bet back, but rather runners to give a serious look at given the trips and the trouble spotted by our expert handicappers at AGameofSkill.com. Horses below listed in track name order. THE MIXER (Race 6, June 23 at BEL, Maidens Claiming 6 furlongs, originally scheduled for turf but run on muddy main). Fifth choice in field of 8. Eventful trip for this debut runner. Leaned up against the inside of the gate when opened by the starter and was very slow to depart. Stayed very wide down backstretch and moved into contention by going 5 wide in Belmont’s big far turn. Came out of turn and was making bid when another horse slightly brushed him and then broke down. Despite the distraction the gelding continued to run and finished third. DE BALA (Race 8, June 23, maiden cl, 6 furlongs). This guy made a long sustained run and his momentum caused him to corner wide at the top of the stretch. He never gave up trying and continued on well to gain second behind the 6-to-5 gate to wire winner. Solid effort. THAT’S ME (Race 7, June 23 at CD, Maidens at 6 ½ furlongs). Second choice in field of 12. The filly experienced a nightmare of a start with her nose touching or nearly touching the ground when stumbling from the gate. An excellent job by the rider to avoid a fall and a catastrophe. Started last and once she had motion she was taken wide and kept away from the field. Entered the far turn tenth and very wide and maintained that poor position throughout. When straightened into turn she was about 7 wide and began to roll 3/16ths from the wire. Ran exceptionally well and finished third. A remarkable race considering the horrible start. LADY DURLYN (Race 6, June 23, starter allowance, 7 furlongs dirt). This runner was not going to threaten the winner who was wrapped up in the final yards, but she was blocked inside with no where to go in mid stretch of this starter allowance. Altered course late and continued to finish willingly. Sneaky good effort and will be dangerous in the right spot for sharp barn. AMERICAN BEAR (Race 11, June 23, maiden, 1 1/16 miles). The favorite broke from a tough outside post and after clearing the first turn 3-4 wide he received a brutal ride. Jockey got him into all sorts of trouble, moving him inside of three horses on the backstretch and from there it was trouble with a capital T. Jock put a strangle hold on the horse most of the far turn and when he finally got clear at the 1/8th, he had little left. With a clean trip this one contends at the same level next time out. WAKINA (Race 3, June 23 at DEL, 6 furlongs). Longest shot on the board in field of 6. Very tight field out of the gate with this filly initially settling in second flight but was forced to check and take up with about a half mile remaining. The filly was 5 wide the final portion of the turn and stayed in that position in the stretch. She never quit and fought off other challengers to take third. COJAC (Race 9, June 23 at WO, mile 1/16). Fifth choice in field of 7. Tardy with a slight hop from gate. A confirmed sustained energy runner was left behind and then fell victim to a pedestrian pace of 26 1/5, 51 1/5, and 115 4/5. Taken wide 6 furlongs out and remained there into the far turn. Traveled 5 wide in turn and came out of turn 6 wide trying to catch the slow pace. Ran valiantly, never gave up and finished a very respectable third. The 5 year old gelding should do much better with a respectable pace next out. Miss Hemingway (Race 2, June 24 at WO, 5 furlongs, 2 year old maidens, Polytrack). Zipped out of the gate and was well positioned early, then fell back and eventually last in middle of turn. Started to run again once moved outside. Entered turn 6 wide and ran on to be a good but unnoticed sixth. Obviously inexperienced. Blinkers will probably do wonders for this filly. Off the Charts Trip Notes (June 5, 2012) spotlights horses throughout the country who encountered some type of significant or meaningful trouble in their most recent start or just gave an extremely impressive performance. Please note that horses spotlighted in Off the Charts Trip Notes are never an automatic bet back, but rather runners to give a serious look at given the trips and the trouble spotted by our expert handicappers at AGameofSkill.com. Horses below listed in track name order. Only Exception (Race 8, May 30 at Arlington, 5F, turf). Favorite in field of 9. Hard to believe jockey James Graham and his filly did not completely fall on the Arlington lawn after a horribly bad start. The filly went to her knees and it appeared that her nose actually touched the turf. She was immediately 8 lengths behind the first flight before she could take a step. Graham did a very good job not to rush his mount and quickly took her to the outside. She traveled 5 wide or more throughout the entire turn while Graham refrained from asking her for run. Once totally out of harm’s way, in the middle of the course she began to rally and did a very good job for a respectable third. Preach Easy (race 4, May 28 at Monmouth Park, 5 1/2 furlongs turf). This daughter of Corinthian was making her turf debut, sprinting for trainer Ramon Preciado and I expected a big effort from this three year old filly. She did not disappoint, rallying from well back under jockey Joe Bravo to narrowly miss at the wire. Unfortunately, she was stopped abruptly at the top of the stretch, which was actually hard to see because of how the horses were positioned on the screen. That critical loss of momentum in this short race clearly cost her the race. She can run on any surface but look for her in a turf sprint claimer. Home Field (Race 7, June 2 at Presque Isle, 1mile 70 yards). Favorite in field of 8. Forced to stay on rail with no place to run and was being restrained on the far turn. Made move at top of stretch, was going out then moved in, then moved back out and was squeezed during rally at the leader. Fought gamely in tight quarters but lost ground due to trouble and finished a good third. One to watch back for sure! Kiss In The Forest (Race 6, June 3 at Woodbine, 6 1/2F, turf). Longest choice on the board in field of 6. Filly was ready to run in first race after layoff. She stayed along the rail with no incidents until top of the stretch. When asked for run she moved well but went out then back inside, then back out and back in. With a 1/16th of a mile to run, she was behind a wall of 3 horses and could only be an observer at that point. She appeared to be an off the pace winner, at big odds mind you, with a clean trip. Forest Gamble (Race 7, June 3 at Woodbine, 6 furlongs, maiden special weights). In the very next race after Kiss In the Forest’s troubled trip, this first time starter crushed a field of maiden special weights runners. It was so impressive that she gets on this horses to watch list despite any trouble. It is not easy to win first time out, and Forest Gamble looks like she has a bright future for trainer Josie Carroll.